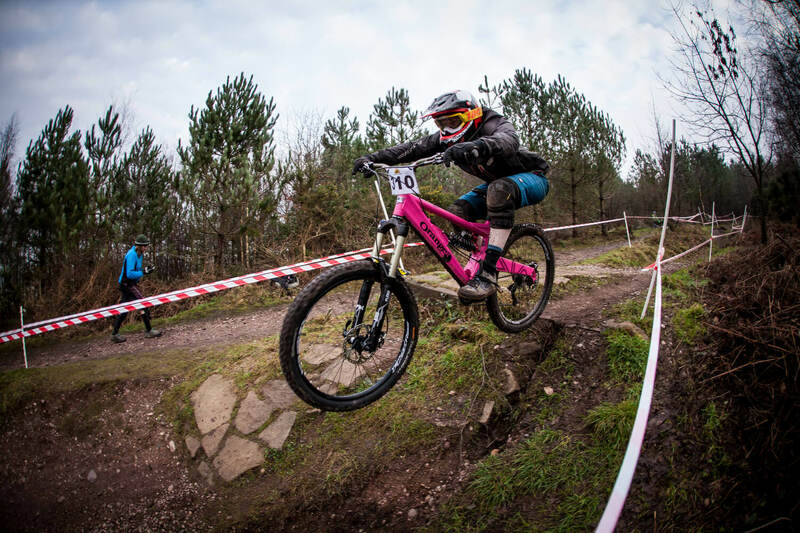 The event took place on 23rd January there were 132 riders competing with 9 in the women’s category. Here’s Kate’s race report. While I sat in my van waiting for the windscreen to defrost, pre-race belly nerves started to flutter. I was heading to Stile Cop at Cannock Chase in the Midlands, to take part in the Racers Guild Winter Classics. Apart from the Redbull Foxhunt this is only my second race, so I’m still getting into the swing of race days and I just so happened to park opposite my new team mate Rebecca so that was a nice surprise! We set off on foot to take a look at the track. A nice fast short track, which starts with a number of drop offs, followed by a decent jump heading into a nice tight berm and twisting corners. The bottom section was loose and rooty and was proving to be quite tricky, especially with a bog forming just before the finish line. I’ve never seen so many riders stopped dead in their tracks, frantically dismounting and running with their bike in tow over that finish line! All good fun! After a few practice runs down, we gathered at the top ready for the start of the race. At this point all the girls had struck up a rapport and were in full conversation and high spirits. As the race was due to start, I was feeling quite confident about the track and my practice runs. As we lined up, all the girls showed a united front as they cheered each other ready for the off! With a mixture of nerves and excitement I was ready to go! I got a good flow from the start and gathered speed down the drop offs to the tight berm, trying to keep off the brakes through the next twisty section and adding pedal strokes. I was soon onto the slippery ground, attempting to ride light over the roots into the last bend. I’m unable to avoid the dreaded bog but managed to stay on the bike and cross the finish line. As we huddled together to await the first timings, I was chuffed to have secured 5th place overall, with a time not too far off 3rd spot. For my second run down I decided to attack the top section with more speed, it was rather less controlled with a few hairy moments, however, I did knock a second off my first run and was still sat firmly in 5th place! It was a fantastic event and I’m hoping to see all the ladies again at future events! Big thanks to Mark Whyte, Harry Clark and the rest of the team and a huge thanks to Dave Price, for the awesome picture captured during the event!